The Holly plant can range in height from under one foot to over 80, and is found in both temperate and tropical regions. There are more than 400 species in this plants family, with this particular shrub having its origins in Korea, Japan, and regions within Russia. Common associations between Holly plants and Christmas come from the Druids of early British history. They believed the sun never deserted the holly tree and as such, it was a sacred plant to them. They tended to decorate the interior of their homes with holly so that the woodland spirits within this plant might survive the cold winters and in its thanks, the holly was believed to repel evil spirits, and defended the house and its inhabitants from lightening. In more modern times, Holly leaves and bark has been used for various ailments. American Indians wore sprigs of holly during child birth to ease pain and assure delivery of a healthy baby as well as to keep them in good general health and giving them courage in battle. As a hearty plant, the holly bonsai is a perfect evergreen plant with an interesting historical background for bonsai lovers of all mastery levels from beginners to advance to enjoy. This evergreen holly is grown for its glossy green leaves and its red showy berries. Ilex crenata is an evergreen shrub with minutely scalloped dark-green leaves that grow up to 2-3cm long on fine twiggy growth. It has delicate white flowers in the spring that produce shiny berries. When kept outdoors, your Holly bonsai will require some frost protection, and should be sheltered from strong or cold winds in which a cold frame or storage shed would be very helpful in order to prevent stress. This bonsai will tolerate both sun and shade, although semi-shade is preferable in midsummer to prevent scorching of the leaves. Increased light tends to produce dense foliage. If indoors, provide plenty of bright light. Your Holly bonsai needs a fair amount of water, especially before fruit production. Holly can be badly damaged by drought, and is not tolerant to restricted water conditions or neglect. Reduce watering in winter months, and provide ample humidity with misting, unless it is in full sun. Feed this bonsai every two weeks during the growing season, using half strength liquid plant food, or bonsai food. Holly bonsai will look their best if you cut back new shoots to the one or two nodes closest to the trunk. Keep in mind that the branches can be very brittle, so shaping is best done by pruning rather than wiring. If wiring must be done, it is best to wire in spring-summer, taking care to protect the bark with raffia. You can reduce leaf size with pruning. 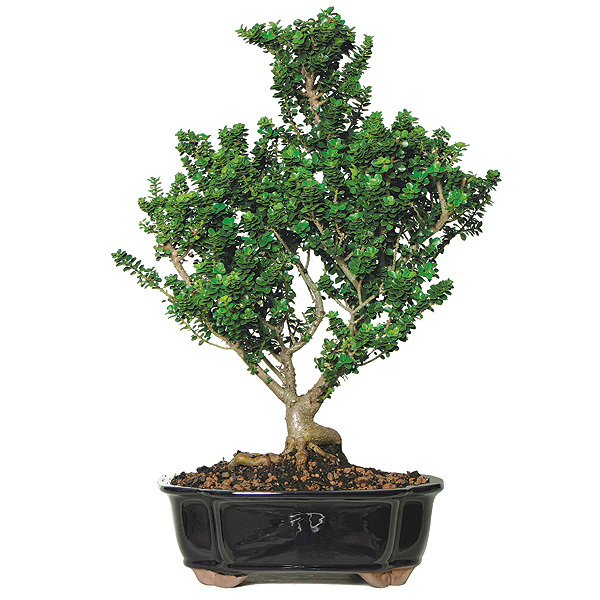 Holly bonsai are suitable for all sizes and styles except the broom style making it a flexible and enjoyable bonsai that will adapt to personal preference. This plant can be weakened by too much fruit production, so it is wise to limit the amount of fruit on the tree to reduce stress and in doing so, reduce the susceptibility to pests and diseases. Young shoots can be attacked by aphids, scale insects during the growing season, so be sure to keep an eye out to reduce the impact of an insect invasion. Aphids can be irradiated with a solution of 1 tsp. dish soap mixed with 1 quart warm water sprayed on the foliage until runoff is achieved. Rinse well with tepid water. Scale insects should be dabbed with rubbing alcohol and removed manually with a sharp knife taking care not to damage the bark and leaves. All hard bodies must be removed as the eggs are protected within, and will wreak havoc if allowed to hatch. Your Holly bonsai is best propagated with cuttings taken from the new wood grown in the current year because they will root more easily. Take these cuttings with a sharp knife in late summer or early autumn. Dip the cutting end in rooting hormone and place in moist soil and shade to promote healthy abundance of root growth. It is best to repot this bonsai every 1-2 years in early spring as the new buds begin to extend and swell using basic bonsai soil. For proper cell growth and optimal health, it is important to keep the leaves of your Holly bonsai dust free. This can be achieved easily with a weekly full body rinse off in a sink or tub.